2017 has been quite a year here at Dance Magazine. From launching our new website to celebrating the magazine's 90th anniversary, it's been a thrilling 12 months. To wrap up the year, the Dance Magazine team took a moment to share each of our favorite highlights. Creative director Raymond Mingst: July's "The Hall of Fame"
I'll take any excuse to paw through decades-old issues of Dance Magazine. Our special 90th anniversary issue this July gave us just that opportunity. We reprinted some of our favorite covers—from Andy Warhol's illustration of Doris Humphrey (February 1959), to Baryshnikov on a motorcycle (January 1992). Assistant editor, audience engagement Kelsey Grills: "The Problem With So You Think You Can Dance's Fast-Food Activism"
Veronica Jiao's smart piece shed light on a serious problem the dance world tends to ignore. Although "SYTYCD" does wonderful things for dance by providing a platform that allows various genres to reach broader audiences, the show sometimes fails to recognize the responsibility it has. I find Heffington to be one of the most fascinating figures in the dance world, and writer Brian Schaefer somehow managed to capture his inimitable quirk. Plus, he talked to Sia, who referred to herself as a "spaghetti woman." Editor in chief Jennifer Stahl: "Why Are We Still So Bad at Addressing Mental Health?" When writer Kathleen McGuire first pitched this story to me, she was super nervous about opening up and sharing her story about how untreated depression led her to quit dance. But as soon as we hit publish, we realized she was far from alone in feeling discarded by the dance world. The outpouring of support made us realize that dancers' mental health is a topic we need to cover further—so stay tuned for more in 2018. I always loved going to see Wendy Whelan perform at City Ballet, and thought it was interesting to hear how she's created a whole second career for herself after retiring from NYCB. Plus, it was cool to get a picture of how she works in the studio and what it's like collaborating with her. Assistant editor Courtney Escoyne: "Making Chicken Pot Pie with James Whiteside"
I really wasn't going to mention one of my own stories, but I had to include this, partially because James is a trip, partially because the recipe is fantastic, but mostly because going to his apartment and being fed homemade chicken pot pie for this article tops my list of the most ridiculous (and awesome) things I've done at Dance Magazine. 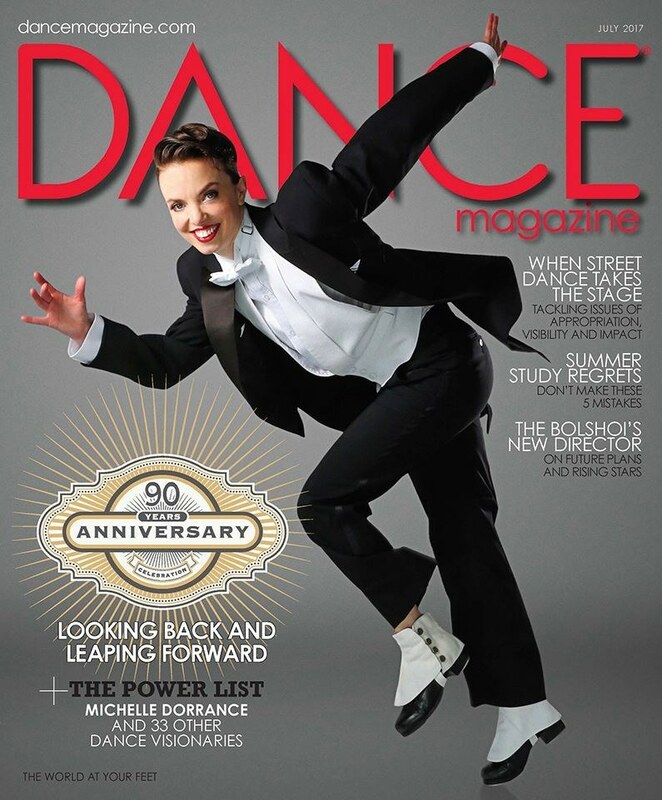 The accompanying 90th-anniversary cover line, "Looking Back and Leaping Forward," is also a spot-on description of Dorrance's boundary-breaking work, and I love how she's photographed in tails in homage to tap's early legends. This fusion is a reminder of what makes great art: perspectives that acknowledge and build on the past, while contributing something fresh to the conversation.